Don't look now, but we should soon have the 30-hour work week as the standard, instead of the 40-hour work week last enshrined during FDR's New Deal. Why, when Americans now work more hours than any other developed country? There are a number of good reasons, and they have little to do with the ACA, or Obamacare, which has decreed that 30 hours per week is considered to be full time employment for large businesses that are required to offer insurance coverage to their employees. But it has a lot to do with the labor slack in our job market that Fed Chair Yellen has been talking so much about, and the declining health and welfare of American workers. Thanks to the tech revolution and huge productivity gains of those past 30 years, fewer workers are needed to do the same amount of work in the digital world. So if fewer workers are needed to do the same work, then why are more employees working overtime? Maybe because no policy maker in America has thought through the consequences. What would it mean to share the workload with more people? The Germans certainly have done something about it. Rather than fire employees when times were tough in Germany's last recession, firms hit hardest by the reduction in demand reduced their employees' working hours to spread the pain. And, the four-day workweek is nearly standard in the Netherlands, especially among working moms, according to a CNN Money article. Overall, the entire workforce averages around 29 hours a week -- the lowest of any industrialized nation, according to the OECD. Some 86 percent of employed mothers worked 34 hours or less each week last year, according to Dutch government statistics, as reported by CNN. Among fathers, about 12 percent also worked a shortened workweek. Denmark is close behind with a 33 hour average work week and five weeks of paid vacation. "Dutch laws promote a work-life balance and protect part-time workers," said the report. All workers there are entitled to fully paid vacation days, maternity and paternity leave. A law passed in 2000 also gives workers the right to reduce their hours to a part-time schedule, while keeping their job, hourly pay, health care and pro-rated benefits. Whereas in the U.S., a Gallup survey last summer found that the average for full-time employees was actually 47 hours -- or 46 if you isolate those workers with just one job. Either way, that's almost the equivalent of an extra business day on top of the usual five-day workweek. And it's affecting our health and longevity, said the survey. Of the more than 1,200 adults surveyed by Gallup, 21 percent said they worked 50 to 59 hours while 18 percent said they worked 60 or more. Another 11 percent estimated 41 to 49 hours. It is an insanity that American workers have become such workaholics at the expense of their health, their families and their own sanity. The Centers for Disease Control and Prevention cites studies that found "a pattern of deteriorating performance on psycho physiological tests as well as injuries while working long hours." It also cited four studies that found "that the 9th to 12th hours of work were associated with feelings of decreased alertness and increased fatigue, lower cognitive function, [and] declines in vigilance on task measures." Wouldn't this be the least painless way for workers to catch up to the incomes of their bosses that now earn on average 303 times their average employees' income, according to a recent Economic Policy Institute study? 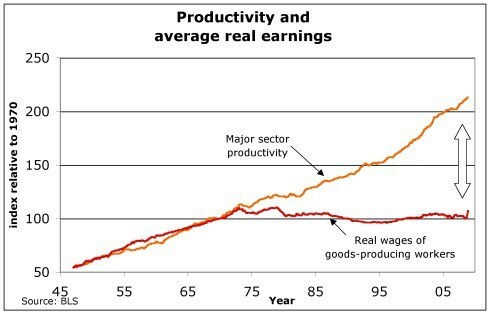 Where have most of the productivity profits since the late 1970s gone, as illustrated by the BLS graph? To those executives and their stockholders, at the moment. It's no longer a secret that America is the most over-worked country in the developed world, according to the Center For American Progress, a progressive think tank. It is the only developed country with no mandated vacation, sick leave or parental work leave allowances, which even many third world countries like Afghanistan and Ethiopia have. In fact, it is already beginning to happen among high tech firms that allow flex hours and even work at home. A 4-day -- or compressed -- workweek is offered as an option to at least some employees at 43 percent of companies, according to the Society for Human Resource Management. But only 10 percent of those companies make it available to all or most of their employees. So there is no good reason American, the richest country in the world, should remain an underdeveloped, overworked country anymore.